On this week’s Sega Addicts Podcast the gang waxed nostalgic all about our favorite Sega handheld, the Game Gear. Briefly brought up was the ad campaign for the console Sega employed in the 90’s that sounded just as douchey as the rest of their commercials of the time. I thought I’d hit up the youtubes and find some of these adverts to see just how d-baggy they could be. Man, was I unprepared. Jeez, Sega. I don’t know if this ad is meaner to Nintendo or dogs. Most Sega ads from this time could be summed up with this. Only dumber. I don’t… I don’t even know what they’re trying to say with this. I mean, yeah they’re saying fat people are Nintendo fans but I’m more concerned with the implications that not only if you see a dead squirrel will smacking it against your head improve your gaming experience, but that it also seems to ignite some sort of euphoric high. Hitting yourself with a squirrel seems to have a similar effect to licking toads or swallowing a ball of hashish. Sounds a lot cheaper too. I don’t know about you guys but if I went on a drug fueled vision quest and all I got out of it was a Game Gear, I’d be pretty pissed. Rednecks just love their Nintendo products. Their press conference at E3 this year was hick city, I tell you what. The convention hall was littered with Bud Light cans and Marlboro Red-butts. Miyamoto’s Freedbird solo on WiiMusic was bitchin’ though. See? Perfectly displays the console with it’s new, slimmer design. Stylish without being in your face. An all-around good ad and no mention of the competitor or what a fat loser you are for owning it. Luckily Sega eventually grew out of this immature phase in advertising for the Game Gear and Genesis when they introduced the Dreamcast. Too bad it was too late. That’s it for this week’s Radvertisements, kiddies. Come back next week for some less a-holey ads (hopefully). What are some of your favorite Sega commercials from the past or present? Let us know in the comments or in the forum thread. And remember, Game Gear did what sensible, mature adultsn’t. New Super Mario Bros. U on the Game Gear…BLASPHEMY!!! Hahaha oh man. I’m gonna have to do a whole feature on those. I didn’t see that redneck ad on YouTube but I read in a comment that it was banned because it was offensive. As far as the last paragraph goes, did Nintendo ever combat SEGA on the advertising front? I’ve only seen SEGA’s side in the matter but I never found an ad where Nintendo dissed SEGA. All of these ads where one company mocks the other reminds me of Sony’s modern ads that criticize the iPhone. It just smacks of smarminess to me. Way to alienate some of your audience, guys. Totally forgot that Sony is currently attacking a mobile phone with their gaming handheld. oh my god those howard johnson ad’s were epic! That was the pinnacle of mid 90’s sega advertisement! 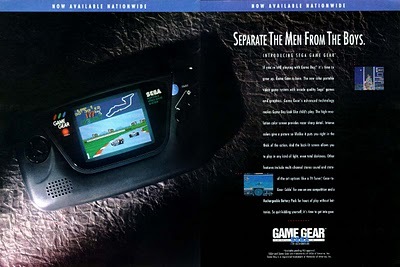 Sega adverts are always the best, but I had never seen these Game Gear ones until now. Very funny, I’m sorry I missed these as a kid. The first two adds aren’t thought out very well. These are crude, insulting and they could have compared the handhelds without slamming the people that already have a Game Boy.